From a perfect free-range turkey to indulgent handmade puddings via a British cheese board selection, you can put quite the Christmas dinner spread on using only Local Food Britain members’ delicious produce. Here are a few ideas to help impress your friends and family this festive season. Winner of Food Producer of the Year at the 2018 Surrey Life Food & Drink Awards, the Joy family has been farming high quality free-range Bronze turkeys since 1929. Based near West Horsley in Surrey, Bramble Farm’s birds are slow matured for a fuller flavour. Recently named South of England Butcher’s Shop of the Year by Meat Trades Journal, Oxshott’s Surrey Hills Butchers is the perfect place to go if you’re looking for something really show-stopping. Whether it’s dry-aged steaks or rare cuts, the attention to detail of this team is second to none and their sourcing is exemplary. Order delicious ‘farm to fork’ produce direct from Dorking’s Hill House Farm. On the menu at the moment are Christmas turkeys, pork and quince sausage meat stuffing and traditional unsmoked gammon ham. They offer free delivery within a 25 mile radius of their farm. Add a little variety to your Christmas dinner table with Gloucestershire Old Spot pork, Dexter beef or honey from Glebe House’s six beehives. The estate’s rare breed pigs and cows live free to roam around the historic Godstone estate. Sussex’s Rother Valley cattle are grazed on hillside clover in the winter and lush riverside pasture in the warmer months – and prepared by their own master butcher. They also have an online butcher’s shop where you can buy organic and free range products from their recommended partners. Sharpen up your canapés this year with Sussex Gourmand’s delicious bresaola - lean, tasty cured meats created using wild venison and grass-fed Sussex beef – and their 2018 Great Taste Awards winning parmesan and nigella seed thins. Driven by a desire to produce the very finest smoked trout, Charlie’s Trout’s delicious kiln smoked trout, cold smoked trout and signature smoked trout paté are perfect as star ingredients for your Christmas dinner table. Hugely passionate about organic food and where it comes from, Surrey’s Greener Greens deliver across Surrey, south London and West Sussex. Their fruit and veg boxes are packed full of seasonal treats sourced from independent growers, and they can throw in a few carefully handpicked goodies, such as drinks as condiments, on the side. A powerhouse of fresh fruit and vegetables in the south east since 1937, Secretts of Milford supply many pubs and restaurants as well as its own farm shop – so why not pick up some of their delicious produce for your own Christmas dinner table? The stars aligned for Briscoe’s Jellies at this year’s Great Taste Awards, with their Furious Chilli Jelly picking up two stars and their Cranberry & Port Jelly and Gorgeous Garlic Jelly picking up a star a piece. Their Cranberry & Star Anise is sure to be a hit during the festive season (and you can always buy a selection pack!). Having started in 2008 as a hobby-business, Bartie’s Sussex Faire, which is owned and run by John Bartlett (aka Bartie), it is now a full-time occupation. His jams, jellies, chutneys, marmalades, piccalillis and mustards offer quick and exciting ways to perk up those Christmas dishes. John and Mary Stratton produce their award-winning vinegars, oils, preserves, rubs and flavoured sugars from their home in Eastbourne. They start sourcing their products right there - from their garden, from friends and neighbours, and from nearby growers in Sussex and Kent. Spice things up this festive season with Dorset’s Deelicious Chilli Jam. Their Habanaro, Chipotle and Classic chilli jam gift boxes are perfect for the dinner table or even as a fiery stocking filler. For an explosion of flavour, try Woking’s Hot Pods chilli products. Their mix and match gift boxes are perfect for people searching for that extra kick with each dish. It’s a little known fact that Father Christmas is only able to keep so warm while whizzing around the globe because of his penchant for Hot Pods’ C-harissa-mas Hot Sauce. Whether you’re looking for the ultimate mince pies or the perfect sourdough loaf, you can’t go wrong with the artisan bread and cakes from Surrey’s Chalk Hills Bakery. They bake bread using traditional methods and a long fermentation process, which results in real, natural bread that looks and tastes amazing. And, there’s nothing that beats fresh bread, right? A family-owned business based on a farm in a beautiful part of West Sussex, High Weald Dairy specialise in creating award-winning artisan cheeses from organic cow's milk, sheep milk and goat's milk. All are made with vegetarian rennet, making these cheeses suitable for vegetarians. You can buy a Sussex cheese selection in their online shop. Based on the Surrey/Sussex border, Bookham Harrison Farms’ Sussex Charmer Cheese is produced from their milk and has won many awards over the years. You could also try their Twineham Grange, a vegetarian Italian-style hard cheese and South Downs Butter, which picked up top marks at this year’s Great Taste Awards. Branching out from The Cheese Man, a well-established Sussex wholesaler of fine cheeses and charcuterie products, The Cheese Hut specialises in sourcing top quality local and continental cheeses. A one-stop shop for the perfect cheese board, basically. There’s nothing like a Christmas pudding to get you into the festive spirit – and there can be few as enticing as those made by LillyPuds in the historic town of Chelmsford, Essex. Full of natural goodness, they contain a minimum of 50% fruit, no mixed peel and have the minimum amount of sugar possible. What is more, they are also vegetarian and contain no milk either. A few sweet treats on the side always does wonders to bring smiles to the faces of the family and act as a perfect pick-me-up on Christmas Day afternoon. Mummy Makes Fudge offer more than 30 different flavours, including vegan varieties. Run by Annys, her sister Hannah and mum Angela, Rowdy and Fancy’s make exquisite chocolates in the Sussex countryside. From their milk hot chocolate meltdowns (stir into a cup of warm milk for a delicious hot chocolate) to their wonderful array of chocolate bars, you’re sure to find something that appeals to most sweet teeth. Something to go with your coffee? Delicious hand-made shortbread rounds using natural ingredients and no added preservatives, The Flavoured Shortbread Bakery’s beautifully crafted treats are made using a traditional shortbread recipe and flavoured with imaginative combinations. With a mission to 'make cake memorable', Velvet Fig's signature bakes really stand out from the crowd thanks to Emma Fuller's brilliant eye for colour. But these cakes aren't just easy on the eye – they taste delicious too. Make sure to check out Emma's Christmas cakes and gingerbread. Heavenly as a spread, sublime in smoothies and porridge, perfect poured over ice cream, born to bake with and a cracking hot chocolate, Cao’s multi-purpose creation is dairy and refined sugar free and suitable for vegans. Made in Surrey, pick up one of Lucinda’s handmade selection packs featuring Classic Cao, Orange Cao and Mint Cao to add a touch of healthy decadence to Christmas. Located in the pretty setting of Hampton Wick, the story of G-Nuts actually starts thousands of miles away in the hot and sunny climes of West Africa. Founded by Funmi Brady, who grew up in Nigeria, G-Nuts uses only the best-quality West African peanuts, which are then hand-cooked in small batches, in order to ensure maximum flavour. Absolutely moreish along with your favourite tipple. Founded by Sidineia Wilson, who grew up on a farm in Brazil but has lived in Woldingham for more than seven years, Cafezinho is an independent coffee roastery based in the Surrey Hills, on the border with Kent. Sidineia’s aim is to directly source the best quality Brazilian green coffee beans, grown in the most sustainable, social and environmental way - and she goes to the top of the world to do it. Surrey Hills Coffee’s roastery was established in 2014, although Swedish husband and wife team, Chris and Monika, had already been in the coffee industry for many years. They roast a number of Espresso blends and their Scandinavian style, medium roast Cottage Filter Blend, as well as different Single Estate coffees. Try before you buy at their Guildford coffee shop. Found at the highest point of the North Downs Way, in the Surrey Hills, Titsey Brewing Co celebrates the history and heritage of the area where it’s based with forward-thinking beers. 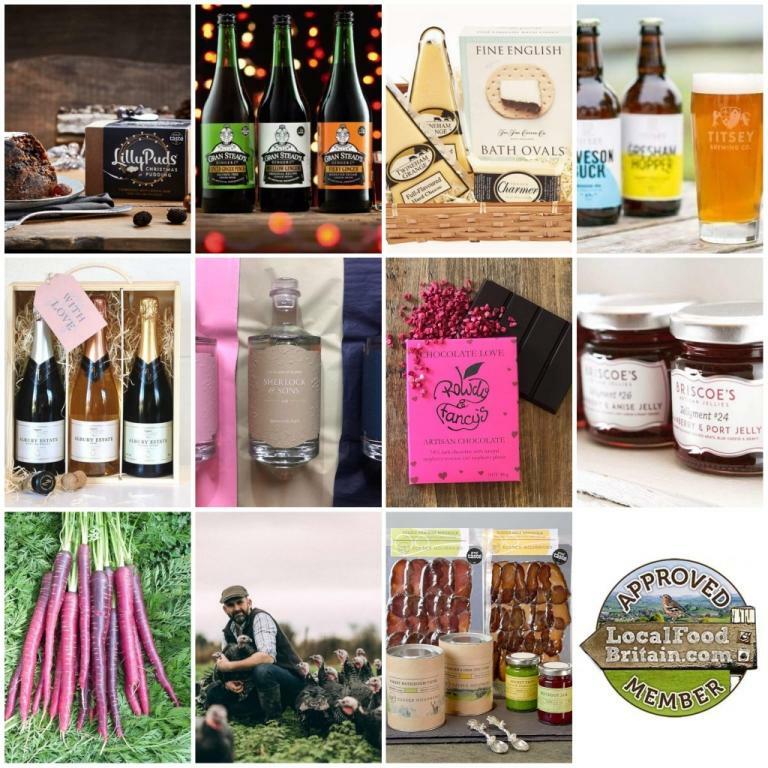 Having just run a successful crowdfunding campaign, they will be looking to expand soon, so why not celebrate with a taste of Titsey this Christmas? Famous for their Fresh Beer Fridays, where you can try beer straight from the cask and take your favourites home with you, The Godstone Brewers beers range from traditional bitters inspired by local myths and legends to green tea infused concoctions inspired by international travels. Always experimenting, it’s well worth keeping an eye out for their latest beers. Having just released their brand new Rye Coffee Porter, Crumbs mission to brew great beer from leftover Chalk Hills Bakery bread continues apace. You can try their latest brew as part of a mixed case bought from their online shop – where you can also buy Reigate Beer Walk coupons for the beer lover in your life. From vouchers for tours and tastings to the ultimate Taste of Surrey gifty box (featuring a bottle of Albury Estate sparkling wine and other treats), Albury Organic Vineyard has Christmas covered with their online shop. They open their vineyard for tastings, sales and self-guided tours on every Saturday and Sunday, 11am - 4pm, and it’s a wonderful place to catch up with friends. Christmas should be a right royal occasion and what better way to add a little sparkle than a bottle or two of Greyfriars Vineyard’s limited edition 2015 Cuvée Royale. They’ve also just released an Old Vines Chardonnay 2017, which is made from Chardonnay grapes from their "Old Plot" - the original Greyfriars vineyard site planted in 1989. The perfect way to explore the world of Kent’s Biddenden Vineyards, grab one of their Introducing Biddenden gift packs. Featuring Special Mead, Biddenden Pear Juice, Sparkling Pinot Reserve 2014, Biddenden Ortega 2016, Biddenden Red Love Apple Juice and Biddenden Strong Kentish Cider Medium, it should tick most boxes. Created by the award-winning Trenchmore Farm, a family-run farm in Cowfold, near Horsham, which is perhaps best known for producing top quality Sussex X Wagyu beef, Silly Moo Cider recently won a two star Great Taste Award. The drink gets its name from the farm’s cows, which go a little bit silly when they get the chance to devour the apple pomace left behind from pressing the juice. A fantastic alternative to sparkling wine, Gospel Green Cyder has spent the past 30 years mastering traditional production techniques to create a fine sparkling cyder. Based on the Surrey, Sussex and Hampshire border, they use only the finest apples hand selected from the Blackmoor Estate. Preparing for their very first Christmas, Distillers of Surrey have enjoyed a meteoric start to life in 2018 and now boast three exceptional gins: Solstice (a fresh and intriguing London Dry Gin), Aromatic (featuring Olive groves in Sussex, rosemary and bay from Surrey and tea from the UK's first plantation in Cornwall) and Nautical (their naval strength edition). They are also selling gin-filled baubles. Needing absolutely no introduction these days, Silent Pool Distillers have helped to transform the Surrey drinks business in the past few years from their Albury beauty spot home. From Christmas Crackers to winter warmers via Silent Pool Gin infused smoked salmon, it’ll be gin o’clock throughout the festive period if you spend a few minutes browsing their shop. You can stock your whole bar up with goodies from Essex’s English Spirit Distillery – you name it, they probably make it! Just added to the list is a new recipe Christmas Spirit liqueur, using one of their small batch rums as a base, and using a Christmas pudding as flavour inspiration for the fresh spices. Delicious. Perfect a winter warmer soft drink or as a mixer with your favourite tipple, Gran Stead’s ginger drinks taste like festive spirit in a bottle at this time of the year. Cosy up, pour another glass, either guilt free or spiked (well it is Christmas! ), and relax. Grab a mellow and fiery gift box for the best of both worlds. Wrights Original Dark Ginger is a traditional drink from the very heart of the Tyne and has been produced by the Wright family through several generations. Indeed, it can be traced back to the 1800's. John Wright and his family, who are based in Oxted, Surrey, now produce this deeply delicious ginger wine as well as a zesty Lemon Sherbet drink and oh-so-fruity Very Cherry. Folkington’s was founded in 2012 by Paul Bendit after 12 years of developing premium and innovative soft drinks for leaders in the catering sector and stand-alone brands. The ambition in creating the Folkington’s brand was to replicate the authenticity and provenance that stand behind fine wines (“terroir”) into a range of fruit juices and soft drinks. How about trying their Duchess of Sussex Cocktail? Gin (preferably a Sussex brand), Folkington's Sussex elderflower cordial, Folkington's Canadian-style ginger ale and American club soda. Enjoy! Founded by small batch distiller and plantswoman, Amanda Saurin, Fierce Botanics create incredible tonic from the extract of plants they grow, pick, distil and wild craft. Perfect mixed with vodka, gin and in cocktails or enjoyed on its own as a non-alcoholic drink, Fierce tonic is ethical, vegan, 100% natural and made in Lewes, Sussex. Drink Fatigue, we’re told, is when you have been suffering with a lack of interest for the drink options available. Twisted Syrups are made in Gomshall by artisan drinks business Bubble & Twist, led by Dean Hart. An exciting step up from elderflower cordial, these marvellous mixes are created with a large dash of out-of-the-box thinking and are truly unique. Click here for a selection of Christmas gift ideas and eating out suggestions for the festive season. Local Food Britain is a powerful food and drink finding platform used by businesses and consumers seeking locally sourced produce. Membership will provide you with increased visibility and marketing tools to boost business. We started in Surrey but now encompass Sussex, Hampshire, Dorset, Kent, Essex and London, and are growing. So climb on board and grow with us. Find out how, here.